This is the classic 1960s United kit. Introduced in 1962, this was the first all white shirt since the mid-1920s, with every design since then having either black hoops, stripes or a V design dominating the shirt. 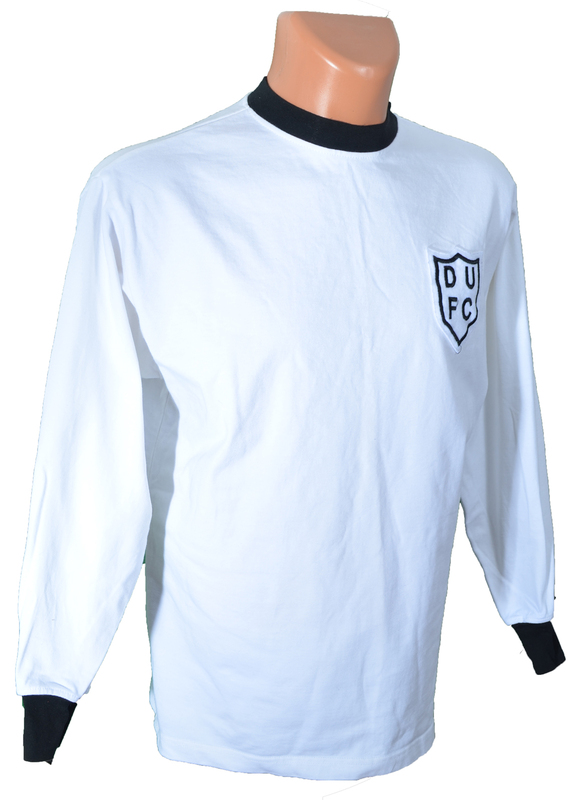 This long sleeved cotton jersey had a round black collar and matching cuffs, and wore the DUFC Shield that had been used on the shirts since 1958. This was the first, and so far only time, the home kit had been entirely white, accompanied by plain white shorts and white socks with a black trim. It is currently unknown when this kit made its debut - the above date is an estimate - as it was first used as an alternative over the colder months during the 1962/63 season. It eventually became the main home kit in 1964, and was used as such for six seasons. This kit saw the emergence of United as a major force in Scottish Football, and was worn as United entered the European scene for the first time, with the famous victories over Barcelona in 1966. It was last worn at the Home kit in 1969, when the Club decided to go with a new modern colour, as it was becoming increasingly noticeable that the white kit clashed with many other Scottish teams kits throughout the season. However, after the change to tangerine, the all white and all black kits from the 1960s were used as change kits up until 1972, with the white shirt occasionally worn with black shorts. In the early 1990s, the shirt made a return to the terraces, when the Club joined in with the new trend of selling retro jerseys to the fans. These days the shirt can still be bought via The Old Fashioned Football Shirt Co. (TOFFS).